Sorting through my masks to prepare the last few posts, I collected an assortment of related material. I will draw from this collection for the present post and a few others over the coming weeks, while the previous related masks are still fresh in our minds. I will begin with a very attractive mystery mask that I bought from Spencer Throckmorton in 1996, along with with three carved wooden wands that would have been carried by the dancers. The mask was said to be from the Mexican state of Hidalgo, and came with no other information. I have never seen a mask exactly like this in any other collection or in any book, although it vaguely resembles the Carnival Moor masks in recent posts. Because I have seen Matachines dancers elsewhere who carried characteristic dance wands, I wondered if this mask had been worn by a Matachin dancer. Here is the mask. All of the decorative elements on the mask, as well as those on the dance wands, were created with shiny cut paper. Looking at the mask with fresh eyes after it lay protected in a box for the past twenty years, I was most interested to notice that the face is divided into two halves—one side stained reddish brown and the other side painted black. This alerted me to the probability that this was the face of a supernatural being, and one that straddled some polarity such as life and death (the living dead who appear during Todos Santos or Semana Santa) or good and evil (such as Diablos). Last week I displayed four classic Azteca masks. I noted that these were considered to be masks suitable for La Danza de la Conquista (the Conquest Dance), but they actually dance during Carnaval (Carnival/ Mardi Gras). I included several videos that showed these masks in Carnival dances in two towns in Veracruz—Cruz de Ataque and Zacualpan. Recently when I examined the masks in the James and Jane Urmston collection, I noticed two masks which had striking noses, but neither looked like these classic Azteca masks. The Urmstons, who had collected these masks during a period of years when they were living in Mexico, had the impression that these were also Azteca masks. Where these masks had performed was undocumented. These masks have been sold by the Urmstons, but they gave me permission to publish their photos. I was particularly interested because I had a group of masks that resembled one or the other of these; were they also Azteca masks? To cut to the chase, I ended up with the impression that the two Urmston masks and my similar examples were more likely to be masks from the Santiagos or Santiagueros dance, although they did share with the Azteca masks the trait of large and dramatic noses. 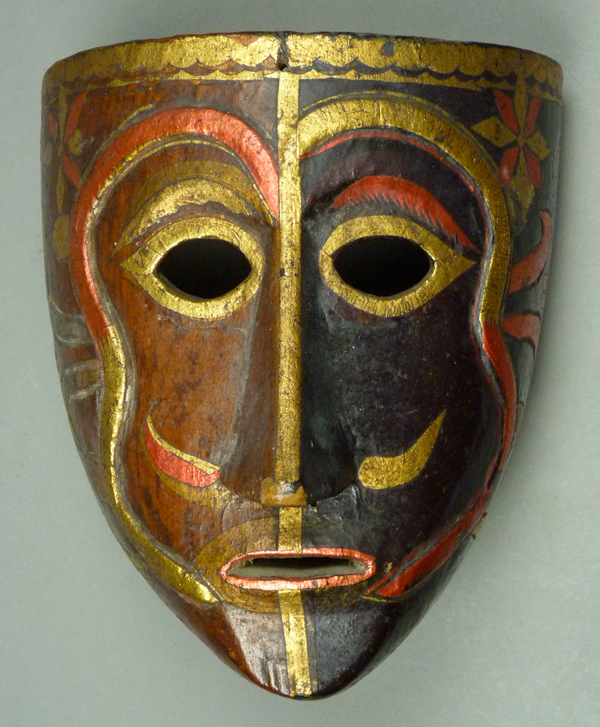 Here is one of the masks from the Urmston Collection. Isn’t it remarkable? This mask was collected by the Urmstons in the Mexican state of Puebla, in 1980. One of the goals during my recent review of the Urmston collection was to learn from masks that were relatively unfamiliar to me. One discovery was that the class of Azteca masks may be broader than I had imagined. Briefly, Azteca masks are but one specialized subset of masks from the Danza de la Conquista. You have seen other varieties of masks from the Conquest dance in recent posts. Azteca masks have been presented or described in popular books, such as Mexican Masks (Donald Cordry 1981, page 51, Plate 66), Máscaras (Estela Ogazón 1981, page 89) and Tigers, Devils, And the Dance of Life: Masks of Mexico (Barbara Mauldin 1999). These masks portray a Spanish (Caucasian) face that is in contact with a symbolic representation of an Indian enemy; the wearer essentially personifies both sides of the conflict between Nahua (Aztec) Indians and Spanish Conquistadors. In the most usual style, which I will soon illustrate, the tongue of the mask cradles an opposing Indian warrior, but there may be an animal or what appears to be a map of an enemy territory instead. 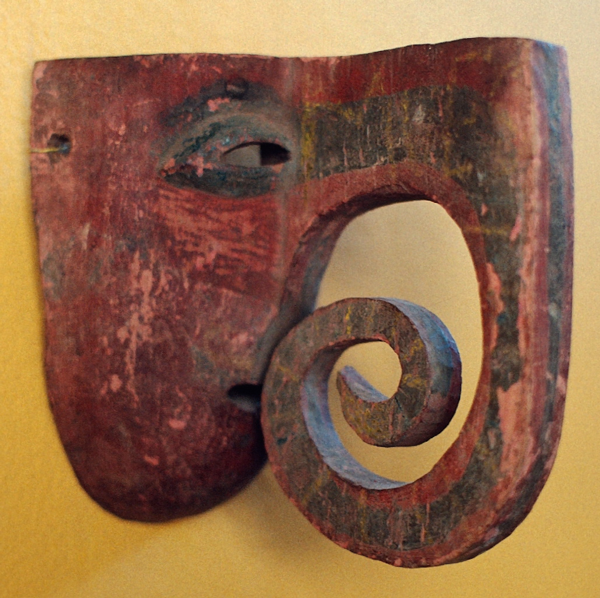 Cordry believed that these masks came from the Mexican State of Hidalgo. 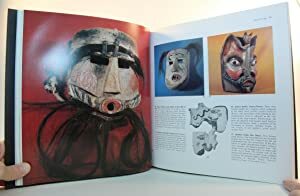 Here is a link that shows the photo of two of these masks in Cordry’s book, for the benefit of those who don’t have that book. I am sorry that this image of the Azteca masks (on the lower right) is so small. Barbara Mauldin consulted Jaled Muyaes and Estela Ogazón and repeated their report that these were masks from Veracruz. She included a dance photo taken by Estela Ogazón in 1991, in Atistace, Veracruz, with this caption—”Conquista masqueraders participating in Carnival celebrations.” That photo (on page 33) shows two dancers, one wearing what appears to be a conventional Azteca mask of a Conquistador encountering an Indian while the other wears a truly unusual Azteca mask. As you will see, the latter is a wickedly amusing example in which the mask’s tongue appears to support a Mermaid’s breast! I had purchased that mask from Kelly Mecheling of New Orleans in 1995, several years before it appeared in Mauldin’s book, and Kelly had obtained the mask from Jaled Muyaes and Estela Ogazón. I might as well begin with that mask. 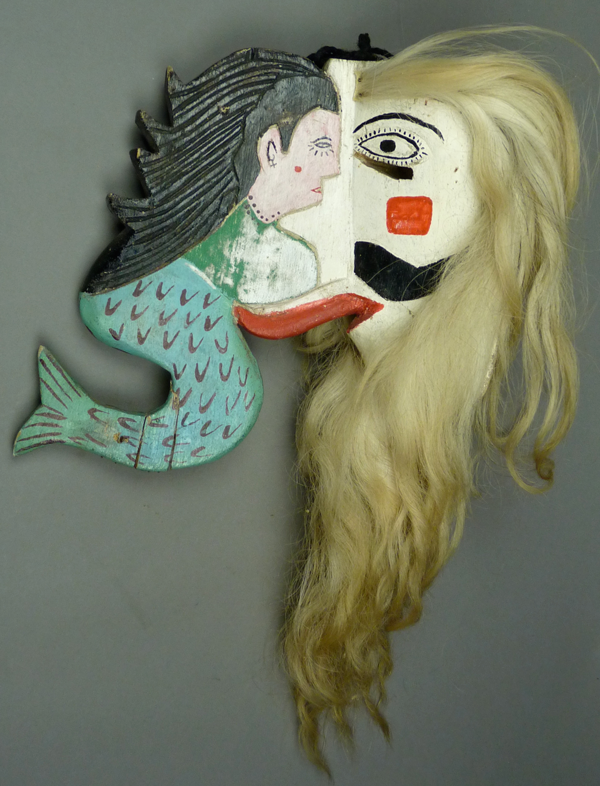 Isn’t this a shocking motif for a dance mask, even though almost anything goes during Carnival. One is tempted to think that this is a fantasy creation, with no connection to an actual performance, but the photo in Mauldin’s book shows it in action. In the photo, the mermaid’s tail appears to be intact, but at some point in the interim it had split and required repair. Having discussed Alta Lucero Bull and sheep masks from the Urmston collection in an earlier post, I will present additional examples from my collection. These masks dance during Carnaval (Carnival or Mardi Gras). I had purchased my first Alta Lucero Torito mask from Robin and Barbara Cleaver in June, 1988. 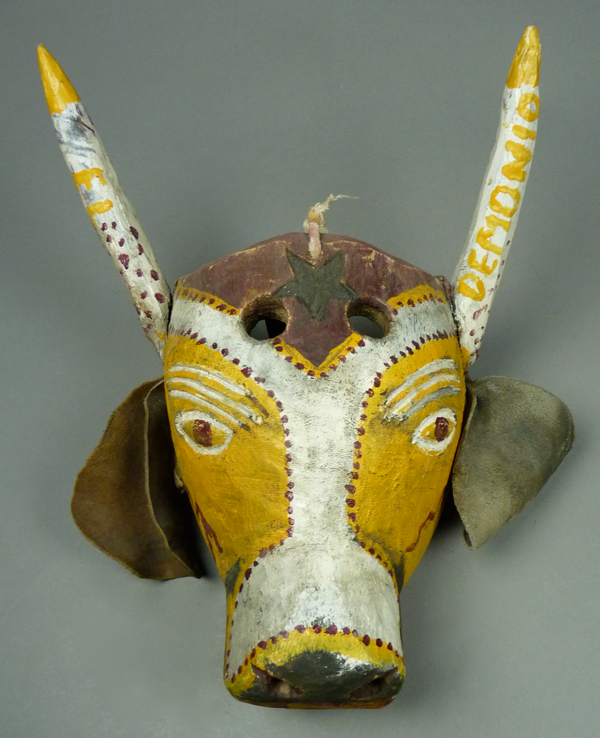 Like a number of the Urmston masks, this one was decorated with painted words—”El Demonio”—El on one horn and Demonio on the other. Here is that mask. I was drawn by the use of such vivid colors, yellow and purple. Also I like the recessed star on the forehead.